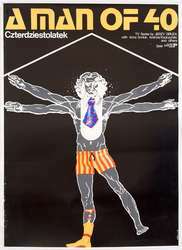 The Polish film poster, with its form and usage of visual language, differed from the commercial, advertising placard. It was characterized by succinctness, the strive for use of the best-aimed visual sign that would reflect the content and mood of the film. The language used by posters at the time was rich: avant-garde typography, combining of styles and mediums, photomontage, drawing, painting. Authors of the presented works are, among others: Andrzej Pągowski, Rafał Olbiński, Franciszek Starowieyski, Roman Cieślewicz, Waldemar Świerzy. The outstanding works of the listed authors confirm the existence of an exceptional phenomenon which is, or actually was, the Polish School of Posters. However, the cinema of the time was exceptional too. It was created amongst others by Andrzej Wajda, Krzysztof Zanussi, Krzysztof Kieślowski, Jerzy Kawalerowicz, Kazimierz Kutz. We present several versions of posters by different authors of the film "Man of Iron" and "Man of Marble", as well as posters of films important for the generation of today's 50-year-olds, the so-called Cinema of moral anxiety. Most of these motion pictures could be watched at "Awandarda" at the Old Town Square. Posters presented at the exhibition were donated to the Museum by Konrad Lenkiewicz who, in this place, showed what cinema is.